CONCORD, N.C. (Sept. 29, 2018) – Chase Briscoe’s first NASCAR Xfinity Series win came in spectacular fashion on Saturday at NASCAR’s newest track. 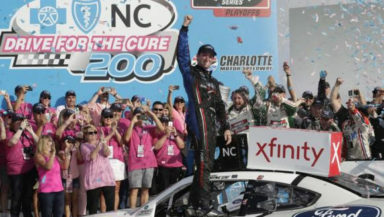 Briscoe’s flawless performance in the Drive for the Cure 200 presented by Blue Cross Blue Shield of North Carolina saw the Stewart-Haas Racing rookie become the first driver to tame the Charlotte Motor Speedway ROVAL™. Briscoe led a race-high 33 laps and held off road-racing veteran Justin Marks with polesitter Austin Cindric third. Cindric dominated Stage 1 before a late spin gave Daniel Hemric the lead. Hemric led the way in Stage 1 and appeared to be on course for his first Xfinity Series victory before he overshot Turn 17 in the closing laps while chasing Briscoe, who pulled away from Marks to register his first victory. Ryan Preece and points leader Christopher Bell completed the top five at the finish. Hemric fell to 15th after his Turn 17 mistake, but rallied to finish 10th. AUSTIN CINDRIC, No. 22 MoneyLion Ford (Finished 3rd): “If I didn’t spin out there (in Stage 1) I would be four or five points ahead of the (playoff) cut line. So, there are some mistakes there that have to be minimized. From the playoff perspective, me and Daniel (Hemric) were the two fastest cars. We both made mistakes that cost us a better finish. You’ve got to have a car that can go on the switchback stuff and make up time in those places. I was trying to make up time in the aggressive spots. To purchase Bank of America ROVAL™ 400 tickets, can call 1-800-455-FANS (3267) or shop online at www.charlottemotorspeedway.com. Kids’ tickets cost just $10.